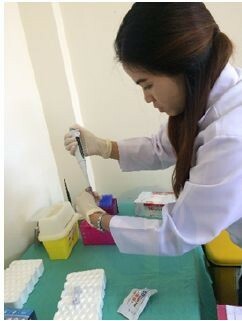 Bounta Vongphachanh, Lao Lux Lab technician. Rapid diagnostic test of sample. In Lao PDR, acute respiratory infections are a leading cause of morbidity and mortality in the general population and pneumonia is a leading cause of death in children under 5 years old. As in other countries, respiratory infections represent a considerable burden to the healthcare system: for instance, up to 10% of outpatients or emergency admissions in Vientiane hospitals meet the influenza-like illness case definition. The etiology of respiratory infections is complex, yet requires a proper understanding at the country level, coupled with genetic diversity characterization and identification of potential seasonal patterns to optimize treatment and prevention such as vaccination in the case of influenza viruses. At least one the 13 virus screened for was detected in 69.6% of the 309 patients recruited at the Luang Prabang Provincial Hospital. Dual/triple viral infections in 12.9%/1.9% of the patients and were more frequent in younger patients. Influenza A and B viruses combined were the most frequently detected pathogens, followed by human adenovirus and respiratory syncytial virus (RSV). The other viruses were detected in less than 10% of the patients. Figure 7: Virus occurrence by dry and rainy season. P-values by Chi-square tests or z-tests (* next to p-value); R: significantly more frequent during rainy season, D: significantly more frequent during dry season. Since most of the patients consulting for respiratory infections are children who also are at higher risk of complications, a follow-up study targeting this population was initiated in 2014-2015 in collaboration with the Children Hospital in Vientiane. Similar detection rates were found: a virus was also detected in 71.7% (319/445) of the patients. Influenza A and B viruses affected more significantly older children while patients with RSV were significantly younger, and only RSV was associated with an increased risk of admission (OR=2.527, p=0.030), attesting for the disease severity of RSV in young patients. Only 23.1% of all patients were prescribed antibiotics. Inpatients were more likely to receive antibiotics than to outpatients (OR=2.144, p=0.005), but there was no relationship between age and antibiotic prescription (p=0.439). Over the 1 year period of the study, influenza A and B virus circulation was not anymore restricted to the raining season, but rather followed a bimodal distribution. Similarly to the previous study in Luang Prabang, RSV was exclusively detected during the raining season while human parainfluenza virus 3 and human coronavirus HKU1 were significantly detected during dry months. 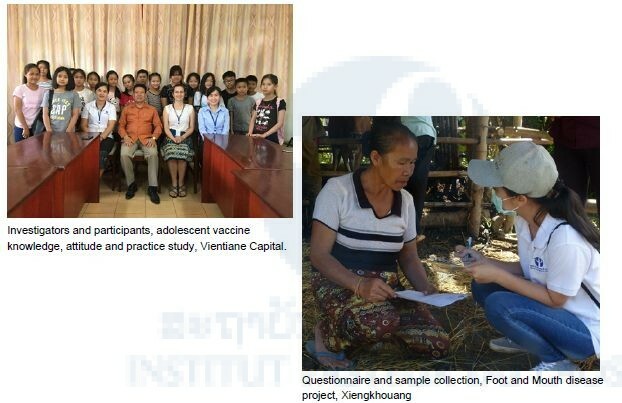 Starting in 2012, Lao PDR started to offer seasonal influenza vaccination in April-May to pregnant women, the elderly, patients with co-morbidities and healthcare personnel. If already implemented 2 years earlier, vaccination during the recommended period would likely have had a beneficial effect on the 2010 influenza season. However, annual variability is to be expected, as shown during the 2014-2015 season. The timing of vaccination against influenza may need to be further optimized, after evaluating seasons variability in number of cases and geographic distribution, antibody waning post-vaccination and disease severity. In contrast, RSV seems to be consistently problematic during the raining season, facilitating vaccination timing when a vaccine will become available. On the other hand, awareness campaigns in health care centres for the management of such patients should already be envisaged to decrease RSV’s burden on young children. Revised guidelines for the treatment and prevention of respiratory infections in Lao PDR, as well as increased surveillance efforts, are therefore needed.